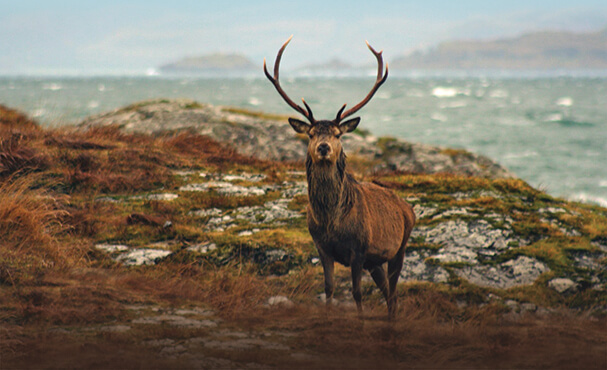 The Stag range includes over 200 DIY Tools with more products continually introduced. 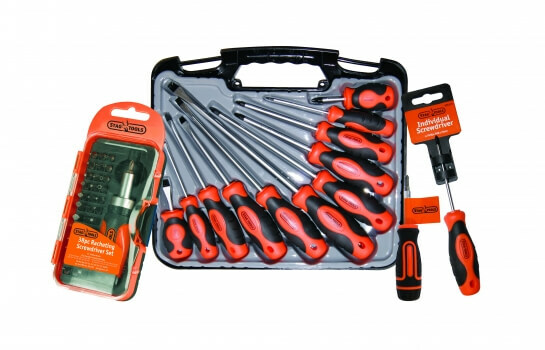 This comprehensive range includes screwdrivers, socket sets, spanners, saws, axle stands, braces and jacks all tailored towards making those DIY jobs in the home or workshop that little bit easier. The striking orange packaging commands shelf presence and respectfully manages the brands identity. There are 3 different types of sockets: lock, super lock (both manufactured from fully polished chrome vanadium steel) and impact (manufactured from fully polished Manganese phosphate). Lock sockets range from sizes 9mm to 19mm. Super lock sockets range from sizes 8mm to 32mm. Impact sockets range from sizes 10mm to 32mm. Stag also have a range of adapters from single to 4 piece sets. Sliding T bars fit sockets sized 1/4, 3/8 and 1/2. They are also manufactured from fully polished chrome vanadium steel. 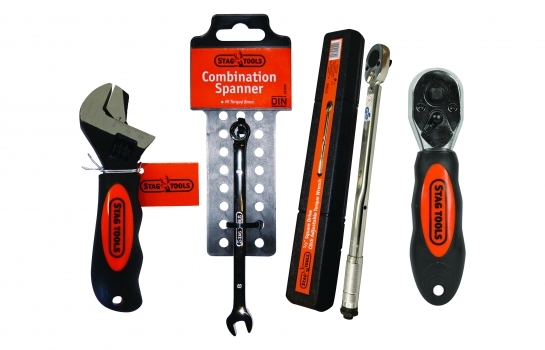 From self-grip wrenches to chained oil filter wrenches, combination wrenches/spanners to adjustable spanners. 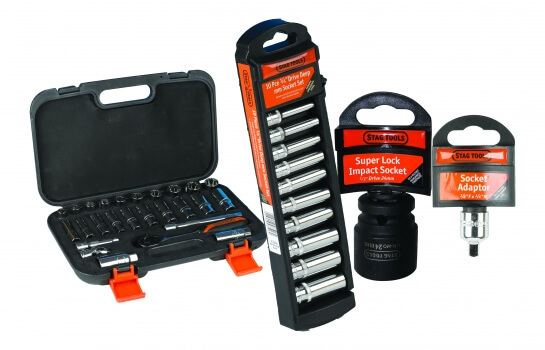 This range is designed for high torque use with comfortable grips to tackle all nut and bolt sizes. Available in singles or sets and also in Slotted, Phillip and Pozidrive types. All screwdrivers come complete with a soft textured grip for additional comfort and magnetic tips as standard to assist in holding screws in place. All screwdrivers from this range are manufactured from chrome vanadium steel with a satin finish. The lifting range was designed with the workshop/garage enthusiast in mind. All products from this range are TUV/GS approved and tested to the highest specification to ensure safety and reliability. 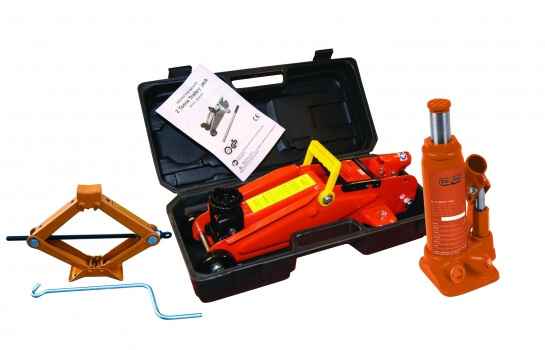 This range covers scissor jacks, trolley jacks, axle stands and bottle jacks all suitable for various weighted vehicles. This range was designed to assist with DIY task on the car around the home and the office. 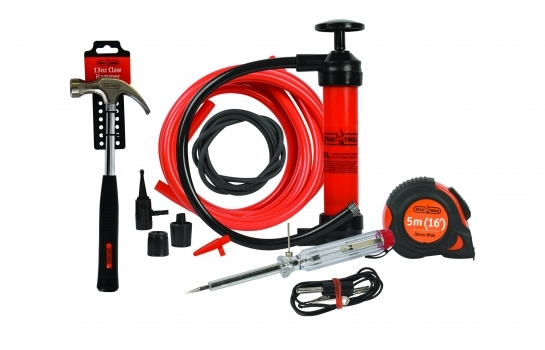 Products include Hammers, Snap on Knives, Measuring Tapes, Hacksaws, Hex Key Sets & Drill Bits. 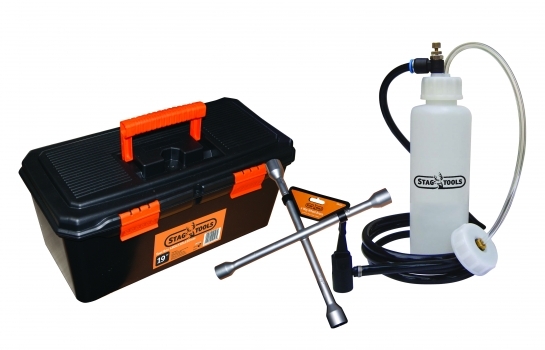 A comprehensive range of quality affordable Garage Workshop Tools. Products include Tool Boxes, Syphon Pumps, Magnetic Pick Up Tools, Brake Bleeder Kits, 4 Way Wheel Brace and Circuit Testers.